I have not been good about training for the past...oh... 6 months. I am signed up for the Rock & Roll Pasadena Marathon in February, and I am pretty far behind. For one thing, I've gained over 20 pounds this year. To be fair, a year ago I was doing Kona so my body weight was a bit artificially low but in all honesty I didn't drop a ton of weight for Kona to begin with. My friend Danielle is also signed up for Pasadena, so she suggested she come over and we could use the two treadmills in my condo gym and motivate eachother for a workout. We got on our two machines and she started going and I - well, the machine just felt funny. It was like the belt was slipping or something. I stepped off, cranked up the speed and it looked and sounded like it was working perfectly. I lowered the speed again, stepped back on and the thing just ground to a halt. So I'm not sure what to think, but the circumstantial evidence is that I'm too fat for the treadmill and I broke it. I went back upstairs and ate the frosted Christmas cookie Danielle brought over to thank me for letting her use the treadmill. I'm overweight and eating cookies instead of running. This is why it's tough to get motivated. 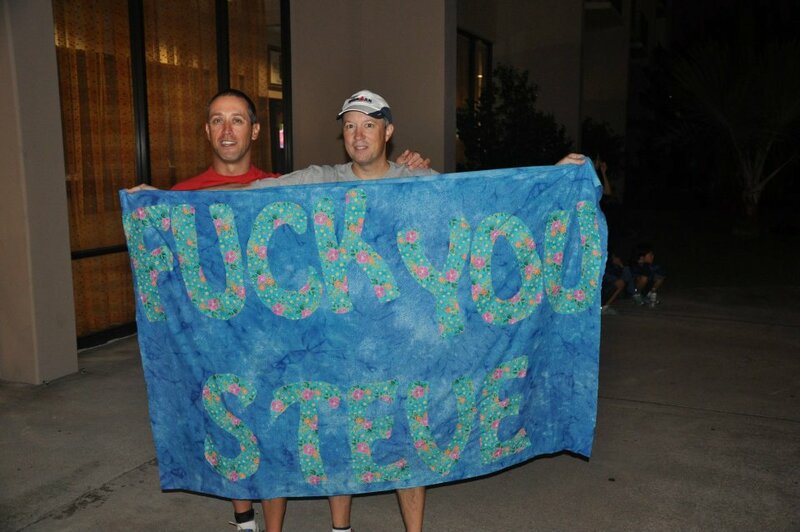 Wiser heads prevailed, and we stuck with the generic "GO STEVE!" when we saw him. It can be tough to talk smack when you're not a fast racer, but that's all part of the Bro Code. You HAVE to talk some smack, right? 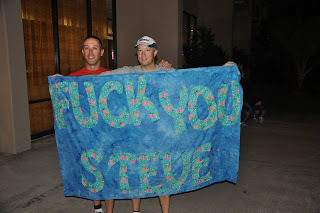 I knew Steve would have a much faster time than me in Kona, so my trash-talking strategy was to undermine the race itself. Steve and I saw Macca at the expo, and Steve told him "I saw your tweets about how good the weather is this year." Macca replied in his thick Aussie accent, "yeah, it was much hodder last year." I told Steve "See?! Macca says it was harder last year!" Steve said "no, he said it was hotter, not harder." I disagreed: "He said 'Harder!'" "No, 'Hotter!'" "Harder!" "Hotter!" Regardless of what Macca truly said, I think hotter means harder anyway, so I declared victory. In terms of actual race-day conditions, some things are tough to compare. I don't know what the swim currents were like this year. We both had winds on the bike, but I don't know the actual stats. There is something called the "radiated heat index" which I heard was 127 last year and 135 this year. It would imply the bike was hotter this year, but I have no idea when or where those readings were taken year-to-year. What I am convinced of - without question - is that the run weather was much cooler this year. It was pretty overcast, and at times it looked like it was going to rain. It was very good running weather as far as I'm concerned. In conclusion, if I had the nice cool weather they had this year, I would have easily shaved 10 minutes off my run. And then Steve would have beaten me by only 50 minutes and I would have beaten the spread. So there.